For more than 100 years Woodard has provided innovative concepts in the patio furniture industry, and the Cortland Woven Stationary Bar Stool qualifies as an example. 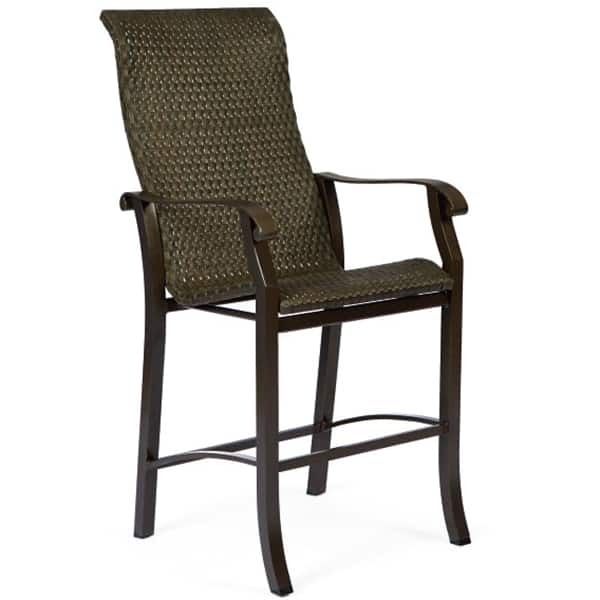 The style is in-between classic and contemporary, with traditional elements, such as the scrolled hand rests and wicker, mixing perfectly with modern materials, such as powder-coated aluminum. While the wicker provides an attractive and rustic look, it also provides virtually no disadvantages, synthetically created by scientists to be used outside in the sun, snow and rain. Both of these materials will resist sun and moisture damage, while providing a soft feel that is comfortable for every guest. W 25" x D 30.5" x H 47.3" LBS 28 SEAT HEIGHT 29"